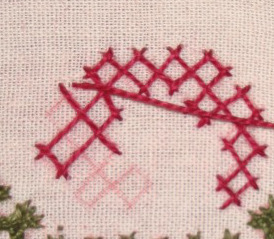 These are the kutchwork border samples that are based on this week’s cross stitch edges on Randje per week 2015 challenge. 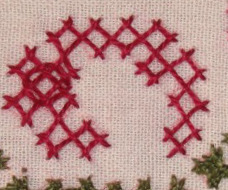 I did not notice that there was an alternation from the original cross stitch graph. 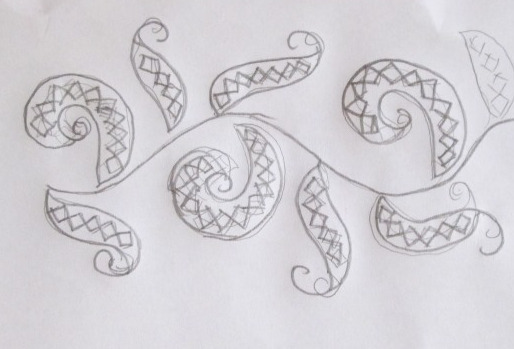 The curve on the bottom needs to face the other side! 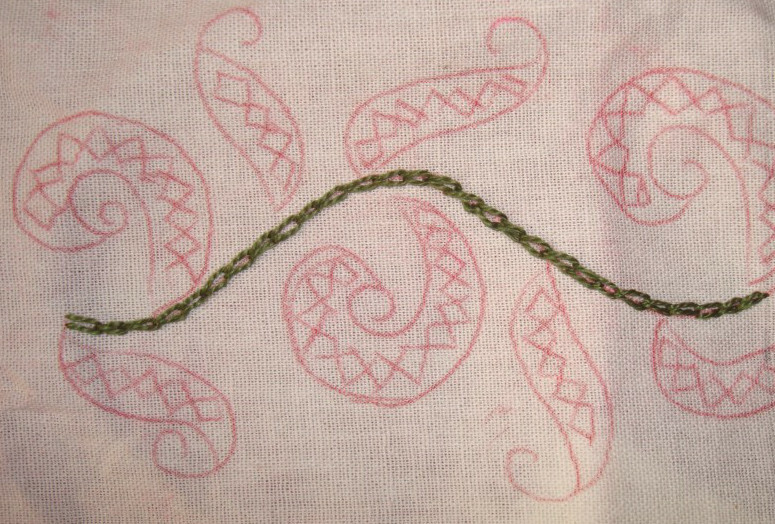 This part of the pattern was worked with the second thread. 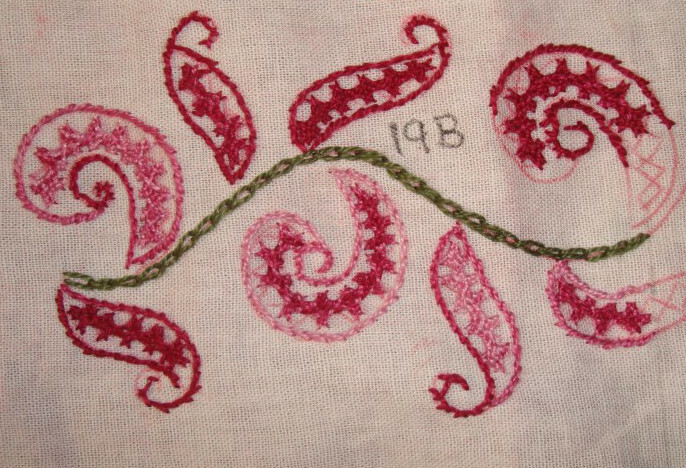 The kutchwork lines are worked here. 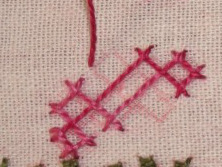 The step line, the basic stitches are worked like this. 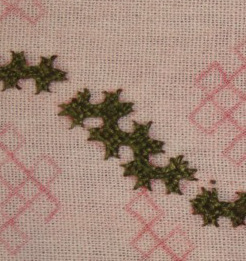 The curve in green thread. 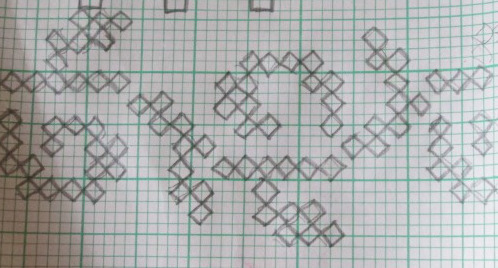 Then the horizontal bar made of 3 squares is worked. 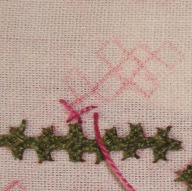 Remember to move up and down the existing thread lines alternatively. 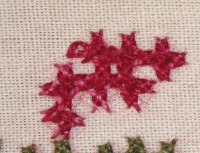 Now for the second part of the interlacing. 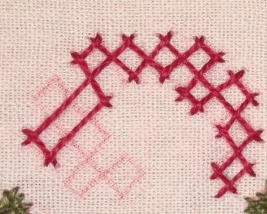 The interlaced first kutch work arrangement. 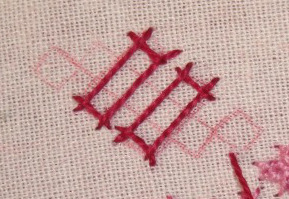 The second one is quite simple. 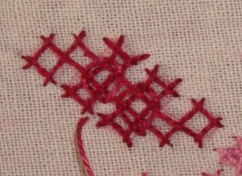 The anchoring stitch is done in two parts. The first part. 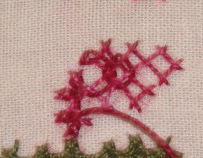 The completed first part of anchoring stitch in this arrangement. The second part. Remember to alternatively move over or under the previously worked lines. 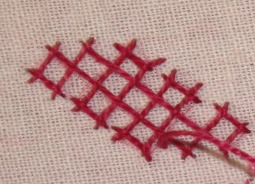 The second part of the anchoring stitch is actually an extended bar. 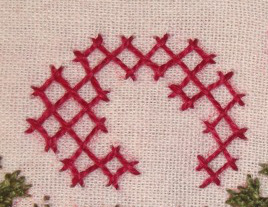 The anchoring stitch completed on this arrangement. The interlacing is also done in two parts. 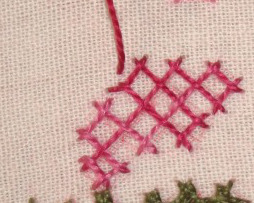 The missed out interlacing stitch is seen here. 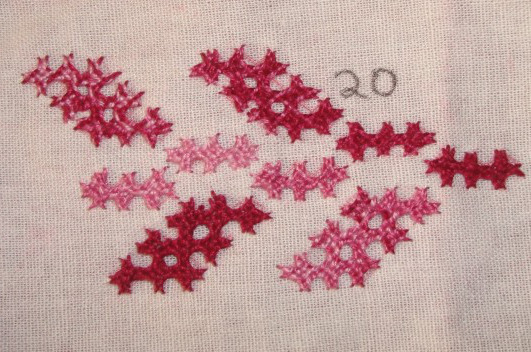 Now on with the second part of the interlacing. 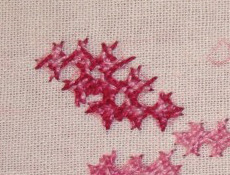 The interlacing on the third arrangement is completed here. 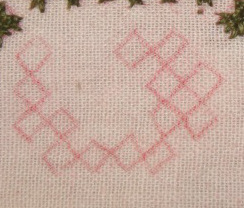 Two extra squares are added to third arrangement. 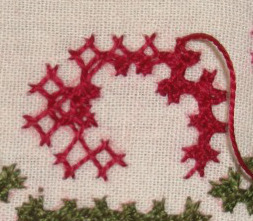 The anchoring stitch of the same.complete the interlacing on this one the same way. 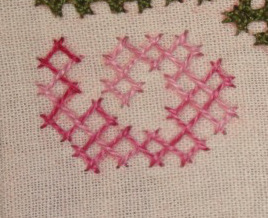 The central curve is worked in chain stitch. 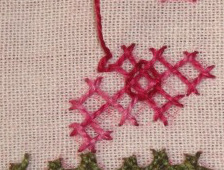 The kutchwork arrangement which is repeated on this border. 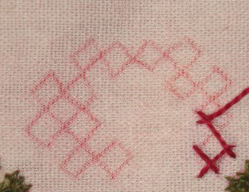 The anchoring stitch done in three parts. 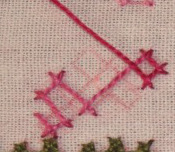 The diagonal bars are worked first. 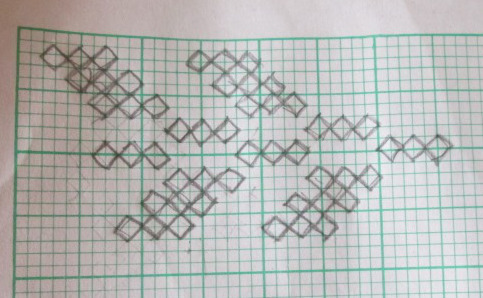 The diagonal bar with two extra squares. 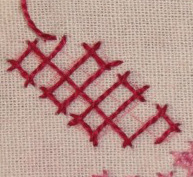 After moving up and down alternatively on the previously worked threads, we have two extra interlacing which are to be worked on this anchoring stitches. 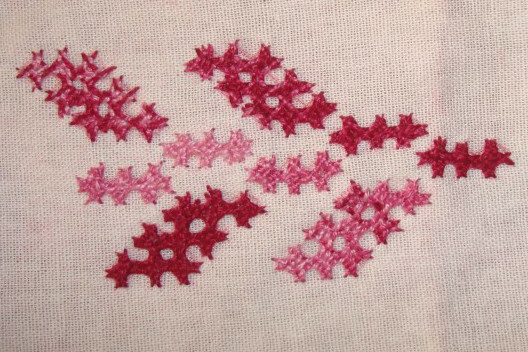 After working the extra set of interlacing, we’ll move on to the interlacing which goes around this arrangement. 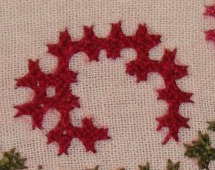 The completed kutchwork arrangement. 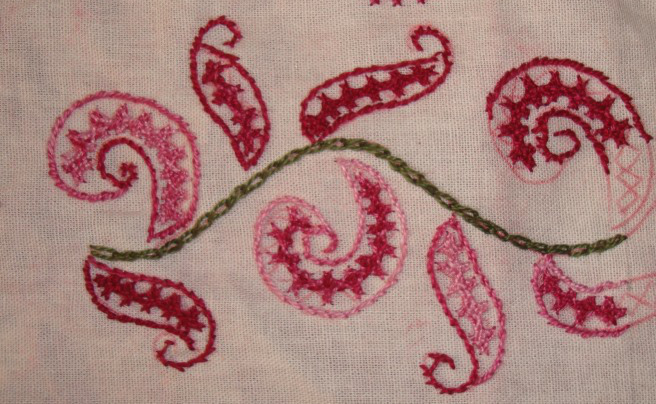 This can be worked with woven kutchwork too. 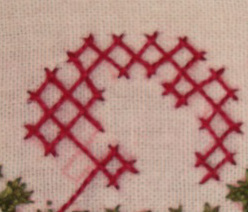 The uniqueness of these border samples are all the elements are worked individually on these borders. 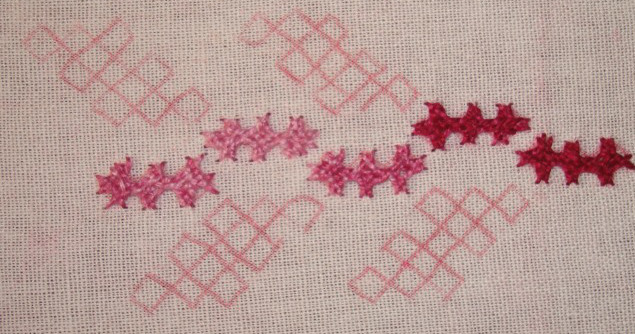 That gives scope for varying the threads, substituting them with linear embroidery and of course mirrors.